Maddie Campbell is so focused on the court, she had no idea when she broke a prestigious record. That’s because the senior is all about the dub—the win—certainly what matters most. 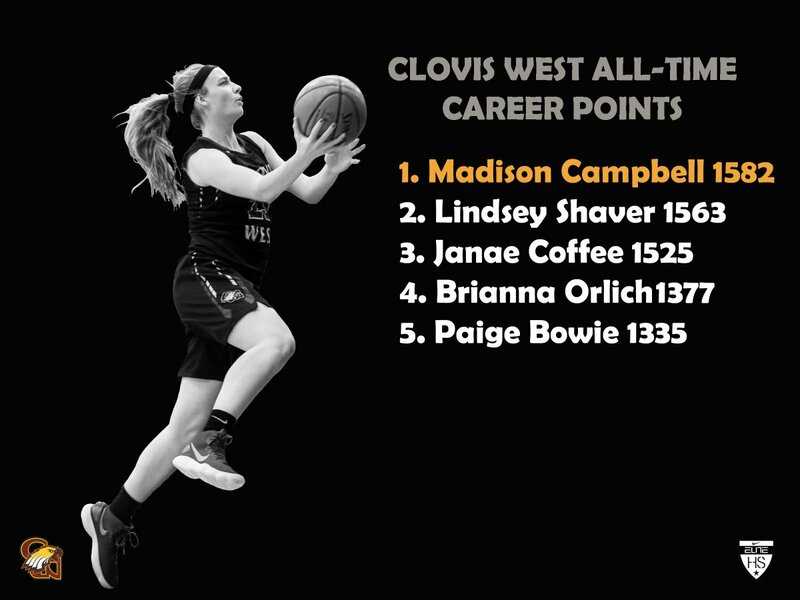 Campbell, a four-year varsity player, became Clovis West’s all-time leading scorer in school history when she scored 24 points in an 84-42 victory over Aliso Niguel from Aliso Viejo. Asked what the shot was when she broke the record? A layup? A jumper in the lane? Perhaps her signature three-pointer? “I honestly have no idea,” she said. That’s Campbell, the words of a coach’s daughter, focused on the scoreboard not the individual stats. Good things certainly have come for Campbell, a 5-foot-10 guard signed to play at USC. In her four years Clovis West has an overall record of 112-12 with three straight TRAC and D-I Central Section championships and a 2017 CIF State Open title, with the possibility of more this season, her senior year. The Golden Eagles are currently 16-2 and ranked No. 6 in the state. Her game is not all scoring though; she is an assassin on the court and has extraordinary court vision. And most of all, she’s the ultimate team player. In addition to averaging over 20 points per game this season, she’s filling up the stat sheet to the tune of 9 rebounds, 8 assists and 5 steals per game, proving her value on the court. As with every great, humble athlete, Campbell credits those who have helped her along the way. Maddie’s father has certainly been with her every step. “My dad has been my number one mentor since Day 1, no doubt,” Maddie says. “Words can’t describe how thankful I am to be able to experience all of this with him.